I’m so stressed Lu. I think my book is s**t and I can’t finish this f***ing scene. Aaaargh. What if i’ve just wasted the last three years trying to write this book??? It’s probably taken years off my life and I’ve been a miserable cow most of the time and what if it was all for nothing?? This was two days before I sent my manuscript off to Catherine Clarke of Felicity Bryan Associates. I’d been working late into the night and getting up before my children to finish the book for several weeks; it was half term; I’d been living on a diet of biscuits and extremely strong coffee. I like to think this goes some way to explaining the melodramatic tone and sweariness of the email. But the fact is I was terrified. Like everyone writing a first book for the first time, I’d invested a lot of time, energy and emotion in my writing, fitting it in around everything else in life, feeling guilty about missing out on time with my kids at weekends. I’d given up any hope of ever having a social life again, worried that I was being self-indulgent in even attempting to write a book – who did I think I was? I was in debt. And I knew it could all have been for nothing. A week later, Catherine got back to me saying she loved the book. A month later there was an auction for my book. 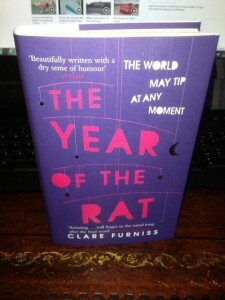 And today that book, The Year of The Rat, is published. To be honest, there are days when I still expect to wake up and discover I’ve fallen asleep at my computer on one of my late-night editing marathons and it’s all been a dream. I know I’ve been incredibly lucky. But I wouldn’t ever have got to the point of being lucky if I’d listened to the Voices Of Doom that whisper into the ear of all writers – you know, the ones telling you you’re not good enough, that you’ll never make it, that you’d be better off giving up and doing something else. So I just want to say to aspiring writers who are feeling like I did when I sent that email: KEEP GOING. Writing a book is hard. It doesn’t just happen, it takes a lot of work. Find other supportive writers you can talk to (or send incoherent emails to in the dead of night) because writing can be pretty lonely, and without them you’ll probably go a little bit mad. Listen to advice from writers you trust – constructive feedback is your friend, even if it isn’t always what you want to hear. Don’t be impatient: get your book as good as you can before you send it off to an agent or publisher, edit until it’s as close to perfect as possible. Accept that even if you do all of these things, it might not work out – even Children’s Laureate Malorie Blackman had 70+ rejections before being published. But if you love writing and you believe in your story, don’t let self-doubt stop you from trying. Of course getting published doesn’t make that self-doubt go away – I’m now writing Book Two and I’m sure there will be many more despairing, sweary late-night emails (sorry, Lu). 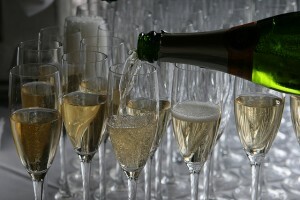 But for today I’m going to celebrate. Congratulations! Great advice and inspirational post. Keep Going! No voices of doom today! Looking forward to joining in the celebrations. Brilliant blog, brilliant book. and it was worth it for all your readers too!